If you loved Munchkin... look out. Here they come again. Now the game is chop-socky Hong Kong action. The characters are Samurai, Ninja, Yakuza, and Monks. The foes are mooks, demons, and assorted bad guys from all the worst martial arts films you've ever seen. Kill the monsters, take their stuff, and be the first one to 10th level! Munchkin Fu is completely compatible with the original Munchkin (and with Star Munchkin, if you're really nuts). Did you ever played Munchkin? No? Too bad. If instead the reply was "yes", then try this one too. 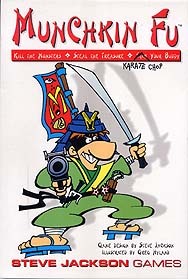 Basically, is the usual theme: kill the monsters, grab the treasures, and karate chop your buddy! Fully compatible with the Munchkin original game (with any expansion you like), this game is the parody of everything you have seen in the Far East movies (including giant monsters, kung fu fighting with wires, and yakuza people with big guns and sunglasses), and will keep you busy for hours indeed. A very very good game!